What a week! We were very busy this week. We presented our Social Studies Assessments. We started working on our Language Arts Assessment. Your child selected a book. They are working on making a project that will teach us about their book! They will need to retell the story and tell us why we should read it. We will begin presenting our projects next week. I loved watching them work this week. They have grown so much in the last few months! They are looking more and more like second graders every day! Due to the short week next week, no school on Thursday, April 18th – Monday, April 22nd, there will be no spelling next week. I will not be sending Friday folders or sending a newsletter. I hope you all have a blessed Easter. I have loved hearing about all of your wonderful family traditions. The week of April 23rd is spirit SPIRIT WEEK! Please check the school website for all the details. We will wrap up the week with our Race for Education on April 26th. *Monday, April 15th we will attend the Stations of the Cross with our 7th grade buddies at 8:30am. *Wednesday, April 17th is a dress down day because we met our school goal for labels. We will also be attending the Pep Rally and Basketball game this afternoon. *Race for Education is Friday, April 26th. This is a dress down day. We walk outside in the morning so dress appropriately! *Thursday, April 25th is Staff appreciation day. We have 2 amazing teacher assistants who help us in so many ways. It would be wonderful if you child could write a note or make a picture to thank Mrs. Taylor and Mrs. Baldwin for all they do for us! We had a great week! We worked on our Social Studies assessments this week. Next week we will be presenting. You can help with this by asking your child to tell you about their delightful destination brochures. Next week we will begin our Language Arts assessment. For this assessment, each child will pick a book to read and create a project to show understanding of the story. We will need shoe boxes for our projects. If you have extra boxes, please send them on Monday. After we have created the projects each child will present their projects and try to make us want to read their book. In Math, we will begin our chapter on Geometry. We will finish up our Stations of the Cross books next week in Religion. We had a lot of fun learning about the author illustrator Janet Stevens. We talked a lot about story elements with her books. Be sure to ask your child about these books. Ask about the setting, characters, problems, and solutions for the stories. We are also working on relating stories to things that happen in our lives. *Book orders are due Wednesday, April 10th. *Our Zoo fieldtrip is Monday, May 13th. *Friday, April 26th is Race for Education. *There is no K-4 Mass next week. The Godfather came to read to us! My name is Shannon Buttell. 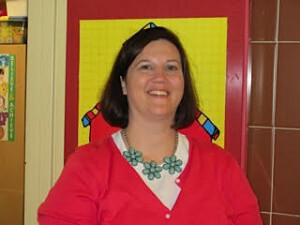 This is my 22nd year teaching at St. Pius X / St. Leo School. All of those years have been in first grade. I love seeing their personalities and excitement for reading and writing develop during the year. Outside of school I love reading and cheering on my favorite teams, the Creighton Bluejays and the Chicago Cubs!